Probably one of the most over-used pieces of advice is the adage “follow your passion.” Students hear it at graduation speeches every year. Startup founders and entrepreneurs hear it from business luminaries – time and time again. This well-worn mantra sounds good. Like most people, I heard it when I graduated from college. I liked it…but is it the right advice? In my opinion, the answer is no. 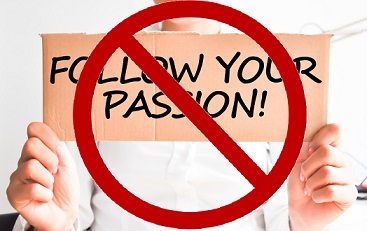 For most people, telling them to “follow their passion” is neither useful nor actionable. It’s probably a waste of their time – and talents. A few rare individuals have followed their passion and found enormous success in both personal and business matters. If you are one of these, congratulations. But this article is not for you. This article is for the rest of us. Problem #1: Is your passion profitable? Passion and profit are not always aligned. Actually, they seldom are. The things we love to do – our hobbies, the causes we support, or the sports we play – seldom generate any revenues for us. Quite the opposite – they often cost money. Passions are things we do that bring internal satisfaction. We do them for the fun or the feeling of well-being, not for the money. Case in point. Going to the movies is one of my biggest passions. I just love a good movie, especially heist movies. I’ve seen most of them. Unfortunately, going to movies with my family does not pay very well. Actually, I have to pay a movie theater to watch movies. I guess if I were to follow my passion, I should be doing something related to the movie industry. But I am not good at acting and have no idea how to produce a movie. Actually, I am not sure I would like working in a movie. I just like watching them. Obviously, there is a big mismatch there. Here is another example. A family member is passionate about flying remote-controlled airplanes. He has loved aviation for decades and has an awesome workshop in his basement. He loves to tinker with his models and do all sorts of cool stuff. But, could he follow his passion and make a living? Perhaps he could make a living designing model planes. Seems like a long shot to me, frankly. I’ll give you one more example. A friend of mine is an avid skier, like many people in the northeast. It’s a passion that runs in her blood. She could become a ski instructor if she wanted to, but the money is not that good. She is a well-respected software engineer who probably earns six figures at her job designing software. She also has a family to maintain. Following her passion is not an option until her kids finish college. Problem #2: Can you perform your passion at a professional level? Even if your passion can be turned into a career or a business, you need to ask yourself, “can I perform it at a professional level?” Just because you like something doesn’t make you any good at it. And even if you could perform at a professional level, perhaps the better question is “do I want the pressure to perform it at a professional level?” In most cases, the answer is no. Let’s use my example again. I love the movies and know a lot about them. However, I know very little about making them and even less about making money in the movie industry. There is no way that I could perform in the movie industry at a professional level. It’s not my skill set. Perhaps my family member who loves model airplanes could fare better? He does love building and designing airplanes. But there is a lot of competition out there. It’s not clear whether his designs would be better than others. Problem #3: Could you run your hobby like a business? Let’s say that you do have a passion that can be profitable and you excel at it. Well, you still have to turn your passion into a business or a career. That is the final nail in the coffin of the “follow your passion” argument. Let’s say you know a person who loves cooking, cooks as well as Gordon Ramsey, and decides to open a restaurant. Makes sense, right? They should have a good chance at it since they are a really good cook. Their passion can be profitable and they excel at it. Any restaurant owner worth their salt will confirm that being a good cook and running a restaurant are two entirely different things. This person will have to find a location, get the right furniture, find reliable staff, and manage suppliers. They will need to come to work early every day to open up and stay late to close when the last customer leaves. They will have to work on weekends and deal with competitors. They will have to handle the marketing of the restaurant and find ways to get “butts in chairs” to keep the place full. On top of that, they will have to cook – every day – and meet the expectations of demanding clients. Doesn’t sound like fun. And most of the activities aren’t related to cooking – what they are actually good at. In fact, cooking will become a job that must be done every day to meet client demands. For most people, the dream of cooking would become the nightmare of running a restaurant. I think there is a better way – at least, a more effective way that worked for me. I think that this approach applies to most of us who are not in a position of making a living by following our passions. It breaks down to very simple advice: follow your skills and follow the money. I am not alone in this belief, nor did I come up with it. It is what many successful companies do. Examine your skills – what are you truly good at? What do you have a knack for? What are people complimenting you for? Focus on developing those skills and mastering them. As long as they are marketable skills, you will do well. As I said before, my passion is watching movies but my skill set lies elsewhere. At this point in my career, I am good at running a business financing company. I know how to identify prospects, I understand their problems, and I know how to solve them. I have spent years perfecting these skills. That is where my skill set lies, so that is what I do for a living. Before working in finance, I worked in telecommunications technology because I also had skills in that area. Trust me, I was not passionate about wireless billing systems or wireless network performance monitoring. But I had the knowledge and the skill set to do my job. By the way, I was not passionate about these jobs but I enjoyed them because I was reasonably good at them. Actually, those jobs proved lucrative and helped finance my startup, and I am grateful for that. Consider skill-development as an investment – because it is. Focus on developing skills that can be used to enhance your business or your career. Look at where the market is going and follow the money. Think of yourself as a business. Let’s take a look at what businesses do. When launching a new product, companies may tell customers how passionate they are about a particular product or marketplace. They say that because it helps them sell. However, look at what those same companies tell their investors. They often include statements like, “We are capitalizing on our expertise to invest in a new market that has the potential to be very lucrative.” They may talk about passion, but only as an afterthought. Skills and profit potential come first. Ok, so at this point I sound like someone who gave up on their passion. Hardly. I enjoy what I do and wouldn’t want to be doing anything else. I am just not passionate about it – not in the way I am passionate about my hobbies. But the question stands. Are we condemned to live our lives doing what we are good at instead of what we love? Well, no. I would not say “condemned.” You can do whatever you want. But if you want success or money, you are more likely to do well by improving your marketable skills and following the money. Lastly, in many cases, being good at something brings people satisfaction and pride. Mike Rowe from Dirty Jobs puts it very eloquently and accurately in this letter. By the way, I have put profit before passion a few times with great success. Here’s an example. I am not “passionate” about the government procurement process. Frankly, I suspect most people aren’t. It can be a long, tedious process. The rules and regulations will put you to sleep. But I know one fact. Many companies that win government contracts also need our type of financing. We found a niche that matches our skill set and is also very profitable. Therefore, we expanded our product offerings to help government contractors and have done very well. Was I following my passion? No way. Was I following my skill set and the money? You bet.